As you walk along the port of Fontvieille, don't just look at the luxury yachts - peer into the water. Unlike the previous portal, this one does not automatically link you, but requires you to go in and enter your own details into a Linky. If you enter anything incorrectly, I will come through and fix it up for you. Oooo Jilly, this is a very yummy scene. Nice theme day post. I love ripply reflections. Cool! I love the reflection - Reflection always makes you think LOL! Pretty paintings in the water. 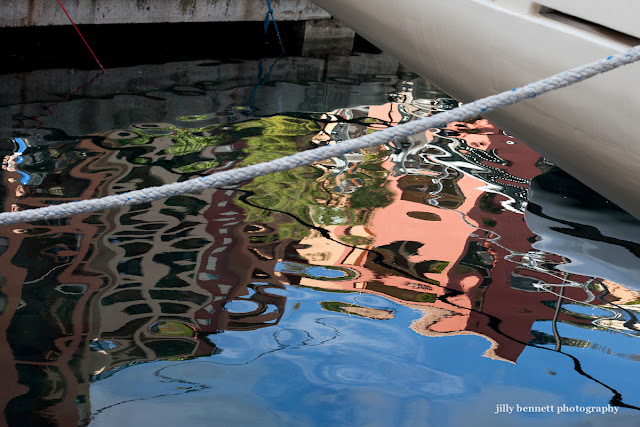 Wonderful reflection and color Jilly. Lovely reflection and well-chosen for the theme today, Jilly. Beautiful reflection and great colour, gorgeous! Sometimes, it is the oil on water that creates the colours. This one is so pure, that way. Beautiful. Love reflections and these tonalities are great! (Happy to read again your kind words). Have a wonderful weekend! You're so right Jilly, you miss such a lot when you focus on the obvious. The colours in this reflection are scrumptious together, and then the blue of the water is the icing on the cake.